With our vast range of skips to suit every job, we’ve got just the one for you. 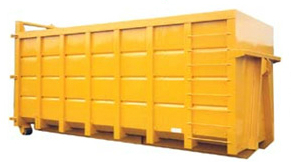 For projects and sites where large amounts of waste are generated, choose a roll-on roll-off container. We collect all kinds of hazardous waste safely and efficiently across Devon, using our specialist equipment and licences. Our ever growing number of vehicles are available to help manage your recycling, haul materials and dispose of your waste. We can offer competitive asbestos collections and disposal.